QTY 5: 1200A GE Magnablast air break breakers, Model GE AM-13.8-500, 500MVA, no structure, presently stored in a warehouse since approx 2003 as spares. Approximately 1953 vintage continuously maintained until removed from service in 2003. QTY 12: 1200A GE Magnablast air break breakers, Model GE AM-13.8-500, 1200A Bus, 500MVA, in 14 section lineup, presently in service. Approximately 1953 vintage continuously maintained. QTY 5: 1200A Powercon vertical lift breakers, GE PowerVac Model VL-13.8-500, 1200A Bus, 500MVA, in 6 section lineup, presently in service. Approximately 1999 vintage and continuously maintained. QTY 5: 600A and (1) 1200A (main) GE AM 4.16-50 breakers within ? 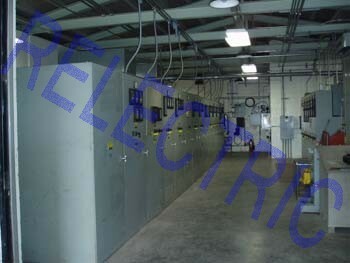 section lineup, 1200A bus, with self contained fused 75kVA 208Y-120V station service transformer and distribution panel.